Best doggy doors for glass? 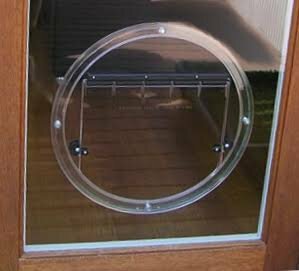 I'm in the market for a medium size doggy door to go in the bottom of a glass external French door. I'd like one that is simple, seals well against the weather and is easily lockable. Don't need any other fancy features - I don't think! I did a search but couldn't find anything recent. Please could the DOL brains trust give me some recommendations? Not the answer you want, but a glass French door doesn't offer much support for a doggy door. Each side normally has two panes with a thin strio of wood between them. I can't see how you could make it work without removing both panes and constructing a substantial wood frame. I think ours was a Transpet brand. Thanks Sangrubber - yes you're right but the carpenter has that issue under control. When I say French doors I'm talking about two doors and not necessarily the multi-pane ones. Thanks Anne, that's what I had in mind - does it lock? When I was looking at them I was considering transpet... or it might have been the transcat? Tiny dog and all. We decided not to get a doggy door in the end. Thanks PK. I'll go and have a look. It does. You can lock it so they can only come in, or go out, or you can have both ways locked. It has two black clips on either side of the internal flap and these turn to lock across the flap. - they’re quiet compared to all other doors I’ve had. Even the dog door which is now 9 years old and was used extensively when my guys were all still on this earth, was quiet right up until the last time they used it. We had ours professionaly installed - which you have to anyway as they’re inserted into glass.